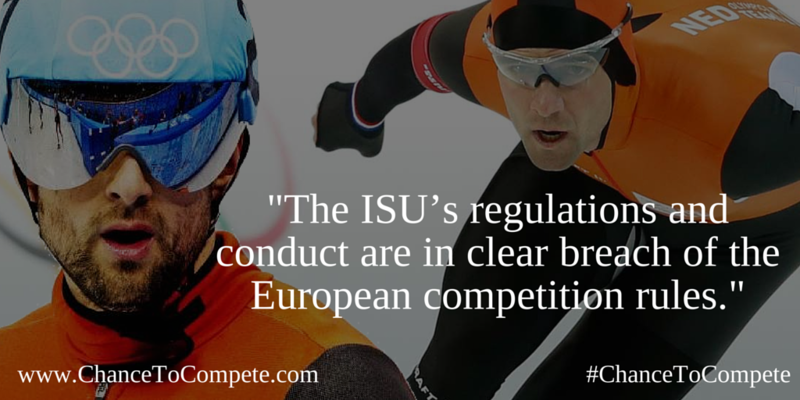 The European Commission has informed the International Skating Union (ISU) of its preliminary view that the ISU rules under which athletes face severe penalties for participation in unauthorised speed skating events are in breach of EU antitrust rules. The ISU eligibility rules ban skaters from international speed skating events such as the Olympic Games or the World Championship, if they participate in international speed skating events that are not approved by the ISU. If skaters break these rules, they can face up to a life-time ban. The Commission’s preliminary view is that the rules restrict the athletes’ commercial freedom unduly and result in a situation where they are not willing to participate in speed skating events other than those organise by the ISU or its members (national federations). This prevents new entrants from organising alternative international speed skating events because they are unable to attract top athletes. Commissioner Margrethe Vestager, in charge of competition policy, said: “International sports governing bodies play a unique role in setting the rules of the game and ensuring standards of conduct. They are responsible for both the health and safety of athletes and for the integrity of competitions. We have concerns that the penalties the ISU imposes on skaters through its eligibility rules are not aimed at preserving high standards in sport but rather serve to maintain the ISU’s control over speed skating. The ISU now has the opportunity to reply to our concerns”. The Commission opened proceedings in relation to the ISU’s eligibility rules in October 2015 following a complaint by two Dutch professional speed skaters, Mark Tuitert and Niels Kerstholt. The Commission’s concerns are outlined in a Statement of Objections addressed to the ISU. The sending of a Statement of Objections does not prejudge the outcome of the investigation. The Commission takes the preliminary view that the penalties set out in the ISU Eligibility rules restrict the commercial freedom of athletes and prevent new organisers of international speed skating events from entering the market because they are unable to attract top athletes. If an athlete participates in an unauthorised event, the athlete faces a range of penalties leading potentially to a life-time ban from all key international speed skating competitions. The career span of a professional athlete is considerably limited in time. As a result athletes cannot risk losing the possibility of participating in events such as the Olympic Games, the World Championships or the European Championships, as this would be extremely damaging and possibly even put an end to their speed skating career. The Commission is concerned that the system of penalties set out by the ISU Eligibility rules, as amended at the ISU Congress in June 2016, remains disproportionately punitive and would prevent non-ISU affiliated players from organising international speed skating competitions. If this concern is proven, the ISU Eligibility rules may breach Article 101 of the Treaty on the Functioning of the European Union (TFEU) that prohibits anticompetitive practices. The ISU is the sole body recognised by the International Olympic Committee (IOC) to administer the sports of figure skating and speed skating on ice. Its members are national ice-skating associations. Sporting rules are subject to EU antitrust rules when the body setting the rules or the companies and persons affected by the rules are engaged in an economic activity. On the basis of EU Court case law, sporting rules are compatible with EU law if they pursue a legitimate objective and if the restrictions that they create are inherent and proportionate to reaching this objective. This assessment can be performed by national courts, national competition authorities, particularly vis-à-vis national bodies, and by the Commission, especially in the case of practices at international level. Many disputes about sporting rules raise primarily issues related to governance of the sport, i.e. relations between different stakeholders belonging or being closely connected to the structure headed by sports federations. Such disputes can usually be best handled by national courts rather than by the European Commission. The same goes for disputes resulting from the application of sporting rules to individuals, e.g. athletes being sanctioned for breach of relevant anti-doping or match-fixing regulations, which can be handled by relevant arbitration bodies or national courts. Article 101 TFEU prohibits anticompetitive agreements and its implementation is defined in the Antitrust Regulation (Council Regulation No 1/2003), which can be applied by the Commission and by the national competition authorities of EU Member States. A Statement of Objections is a formal step in Commission investigations into suspected violations of EU antitrust rules. The Commission informs the parties concerned in writing of the objections raised against them. The addressees can examine the documents in the Commission’s investigation file, reply in writing and request an oral hearing to present their comments on the case before representatives of the Commission and national competition authorities.